In Splashing Hands it is an easy matter to kick to the head, chest, kidneys or anywhere else once you have chopped the opponent’s legs out from under him and he is on the ground. In terms of overall fighting strategy, a very important aspect of this system is learning how to control a fight from the outset. You make the first move and force the opponent to react to it. Too often the average person believes that a fight begins only when the first punch is thrown, ignoring the fact that in a combative situation an opponent has already begun to fight you in his mind. 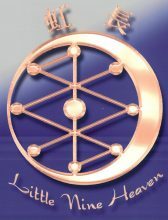 His intentions are expressed in his eyes or face or in the placement of his body. In Splashing Hands training you learn that even though an opponent has not yet thrown a punch or kick, if his face twitches, or he shifts his stance, or even if the wind rustles his eyebrows, he has already made the first move and you must explode into him. In this context, students are taught how important it is to gauge the exact distance between themselves and an opponent, to judge the proper angle for any given situation and to develop precise timing. Because Splashing Hands is an infighting system, working close and sticking to the opponent is of paramount concern. Double blocks, single blocks and strikes along with the sophisticated rolling hands techniques draw the opponent into an attack and pull him dangerously off balance. When the opponent attempts to withdraw from the attacks, the Splashing Hands fighter closes the gap and sticks to him, all the while striking him with jabs, punches, elbows and uppercuts. Once the opponent goes down the fighter continues to stick to him, keeping up the attack until the opponent has been subdued. Splashing Hands, developed at the Shaolin Temple in the late 1700’s, is a close in fighting system of kung-fu. It was taught to those monks who were in charge of guarding the temple gates. 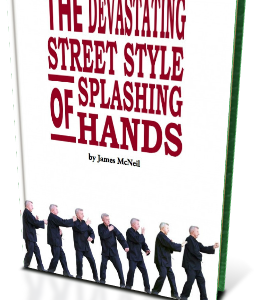 Splashing Hands, named for the way the hands move as if one is shaking water from them, is valued for its explosive, high-speed hand and footwork and its simultaneous offensive and defensive techniques. Historically, only a relatively small number of students learned this system. Even after Splashing Hands was introduced to fighters not associated with the Shaolin Temple, it never became a widely-practiced art. Those who knew the effectiveness of the system were reluctant to share their knowledge with others. Because of this secrecy, it is unknown whether or not Splashing Hands is still practiced today on the Chinese mainland. We do know the style was brought to Taiwan in the late 1940’s and early 1950’s, where a former nationalist army general taught a selected few students.